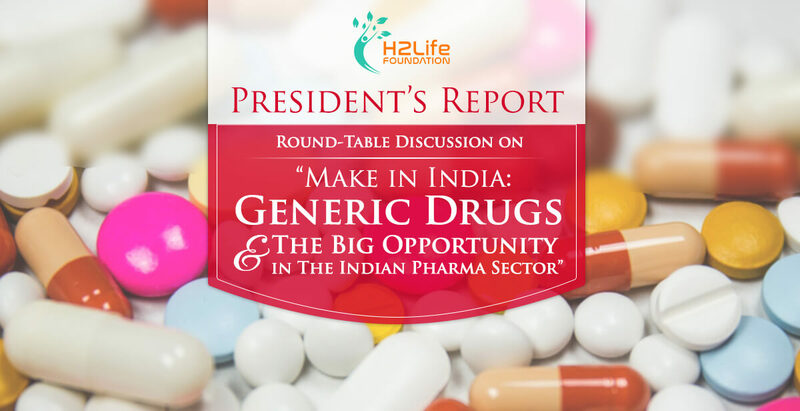 October 11, 2017, New Delhi: H2 Life Foundation organised a Round-Table Discussion on “Make in India: Generic Drugs and the big opportunity in the Indian Pharma Sector”. Mr Vikas Sharma, President, H2 Life Foundation chaired the discussion. Mr Ranjit Madan, CEO, Life Sciences Sector Skill Development Council, was the special guest at the discussion. Dr. Anil Goyal, Hon. Joint Secretary, Indian Medical Association talked about the need to drastically increase the number of Jan Aushadhi stores to facilitate the efficient distribution of generic medicines. He also emphasised on the need to increase awareness about generic medicines and promote their usage amongst the masses. He highlighted that manufacturing of generic medicines in India presents a big opportunity to the pharmaceutical sector and the Indian economy. The pharma industry and the Government must work together towards the attainment of the common goal of providing the highest quality of medicines to the masses at the lowest possible price. A balance must be struck in the cost optimisation of medicines to arrive at the desired result without any compromise in quality. Dr. R.K. Aggarwal, Director, Bureau of Pharma Public Sector Undertakings of India (BPPI) talked about the prevailing quality issues in generic medicines. He said that cost-cutting by pharmaceutical companies leads to an inferior quality of medicines, thus, hampering the government’s initiative to provide quality medicines at low price. Mr Aditya Banerjee, Healthcare and medical devices Consultant stressed on the need to launch initiatives to boost the domestic production of healthcare equipment as much as the need to manufacture generic medicines. Mr P K Gupta, Chairman, Confederation of Indian Pharmaceutical Industry, talked about the need to develop infrastructure and pharmaceutical facilities in India, so the industry may get to the next level in the coming years and patients may get rid of their concerns about costs and quality of medicines. Additionally, in an exclusive video interaction with H2 Life Foundation Dr. KK Aggarwal National President of Indian Medical Association (IMA), provided several crucial insights for the New Pharma Policy. Dr Aggarwal also talked about the need for opening more Jan Aushadhi stores and for launching a digital platform focused on the classification of medicines and dissemination of information for the masses. Dr. Rakesh Garg, Consultant Anesthesiologist and Associate Professor, AIIMS; Dr. Ajay Sharma, Director-Government Affairs, OPPI; Ashok Kumar Madan, Executive Director, Indian Drug Manufacturers Association; Dr. R.K. Aggarwal, Director, Bureau of Pharma Public Sector Undertakings of India (BPPI); Vipul Kumar Gupta, Corporate Affairs, Cipla; Dr. Sanjeev Sharma, MD, MCP, Apollo Pharmacy; Kawaljeet Singh, Asst. General Manager, Mylan Laboratories Limited; Arun Sachdeva, Sr. manager- Regulatory Affairs, Lupin Limited; Amal Sivaji, Head- Healthcare, US India Strategic Partnership Forum; Dharmvir Singh, Deputy Director General, Competition Commission of India; Dr. Aditya Kumar Singh, Senior Resident, AIIMS; Navneet Pratap Singh, Asst. Drugs Controller, Central Drugs Standard Control Organization; and Dhananjay Kumar, Additional Secretary, Union Public Service Commission amongst others. H2 Life Foundation was represented by Masha Mukherjee, Secretary General; Sadhan Mukherjee, Treasurer; Advisor to the Foundation Sumanto Mukherjee (Director, Aspire Institute of Professional Studies); and Advisor to the Foundation Praver Sharma (Editor, Bharat Khabar) at the discussion. The Round-Table Discussion was a huge success and witnessed participation of key stakeholders from varying fields which included representation from government bodies, corporates, hospitals, pharmaceutical companies and consultants, think-tanks, and media personnel. The discussion was concluded with a vote of thanks to the participants.